This is the eleventh blog post in a series authored by twelve individuals who received scholarships to attend the 2018 Science Boot Camp held at Brandeis University on June 13-15, 2018. This article was written by Jaclyn Wilson, an Access Services Associate at MIT, and MLIS Student at Simmons College. 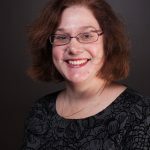 As a paraprofessional in Access Services that is working towards her degree in Library and Information Science, I’m always looking for opportunities to learn more about working as a librarian. Since I’ve always had a great love of the sciences and originally studied environmental engineering in undergrad, since starting on this career path I’ve wanted to eventually become a science librarian. 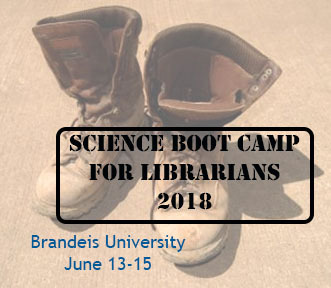 So, when I heard about the New England Science Boot Camp for Librarians, it seemed like the perfect opportunity for me. I was lucky enough to receive one of the scholarships available, which not only covered my attendance at the boot camp, but also provided me with a great mentor, Sarah Oelker. Between a session specifically for the mentors and mentees to meet, meals, and other programming during the conference, I had tons of great opportunities to learn from Sarah about their own experiences in being a science librarian, as well as their experiences on the planning team for the boot camp. I really enjoyed getting to know them, and I left Brandeis knowing that I could always reach out to Sarah if I have any questions beyond the boot camp. The core of the program was three sessions about different science topics- Ecology, Genetics Counseling, and Materials Science and Engineering. Each session featured an overview of the topic, and then one or two speakers discussing their research in the topic. The Ecology session took us from the macro to the micro, and I learned it’s difficult for ecologists to isolate their individual research since there’s just so much interdependence between species and ecological processes. The researcher who spoke has worked on a lot of different topics, but the one we got to hear about was deer ticks, and whether or not deer-hunting is effective at reducing instances of Lyme Disease (the jury is still out on that- even though there was a correlation between tick population and deer population decline, it followed a one-year cycle, rather than the two-year cycle that would be expected). There was also a related activity on Friday, where a few of us went on an ecology hike- of course we actively tried to avoid said ticks while trekking into the woods to learn more about deer population control and the different historical uses of the land we were on. The Genetics Counseling session revealed that genetics counseling is a lot less sci-fi than I would have thought- the topic was not so much about counseling patients about steps they could take to potentially avoid or fix genetic differences that may cause them or their children harm, but more about helping patients understand and adapt to the implications of genetic contributions to disease. We had two speakers for the research half of the session, who talked about a genetic counselor’s role on a research team, and more specifically research in gene discovery in epilepsies- overall I took away that a genetic counselor is really helping patients have all the information they need to make the right decision for themselves. The Materials Science & Engineering session had a great show and tell during the overview- we got to see all sorts of materials that were being worked on by the speaker and his colleagues, including a ball made of an engineered metal that was more lightweight but as strong as one made of a naturally occurring metal. The researcher who spoke next showed how even biological materials could be studied to help create synthetic materials, which could have impressive applications (perhaps even including something like Iron Man one day!). In addition to the main sessions, we also had an evening talk after dinner on Wednesday night, talking about retractions in scholarly publishing. I hadn’t known anything about Retraction Watch prior to this session, and hadn’t yet considered why it would be important to keep track of who is issuing retractions of their work and why. The talk not only taught me about the various reasons for retractions, but also potential issues that may affect users looking for information, like outright deletion of retracted articles or the opposite extreme of leaving articles in databases without a note that they’ve been retracted. On Friday morning, we had the last session of the boot camp- the Capstone about evaluating open access journals and data sets. I learned about important questions to ask when considering these resources, such as whether or not peer review is involved, whether or not the content of an article fits the theme of a journal, and of course whether or not there’s any bias involved in the creation of data or journals. We got to examine a number of journals and data sets to practice thinking about these questions, and discuss with the other attendees our reasoning for our assessment of the journal or data set. This helped me learn about some of the challenges involved in assessing these resources- trying to find information on the data set my group explored was difficult due to missing information in the spreadsheet and dead links, and one of the journals we looked at appeared to have real professors associated with it but didn’t have easy ways to get in touch with the editors (and on further inspection into its listed mailing location on Google maps, it turns out they put down a cabana cafe!). All of the sessions were wonderful, but my very favorite part of boot camp would have to be meeting all of the people there. I tried to eat my meals and spend our break times with at least one or two people I hadn’t yet met to learn about their experience as a librarian or what they were studying, and what they took away from the sessions we had experienced. This year’s boot camp had people from all over the Northeast (and even a few from other areas of North America), and people from all sorts of information professions, not just libraries. Since it was the boot camp’s 10th anniversary we even got a special chance to hear more about the boot camp’s founding and how it had changed over the years at an anniversary dinner. It was great to see that so many people had been with the boot camp since its founding, and to hear how others had been inspired to get involved in the planning after attending their first boot camp. The entire experience was one that I won’t soon forget- I’m so grateful to have been able to attend the boot camp this year, especially as a scholarship recipient, and look forward to attending many future boot camps! I hope you enjoy the latest installment of the Science Boot Camp for librarians. To read the first post please click here. For more about this year’s Science Boot Camp resources or other upcoming events, please visit the NNLM NER website, or contact anyone in the NNLM NER office.